Battery Tender 5-Watt Solar Panel with built-in Battery Tender Super Smart charging controller which keeps your battery safe from over-charging. 100% portable battery charging and maintenance. Perfect vehicles in seasonal storage without access to power. Easy & Reliable. This solar panel kit includes everything you need to keep your batteries charged up with minimal effort using free energy from the sun. 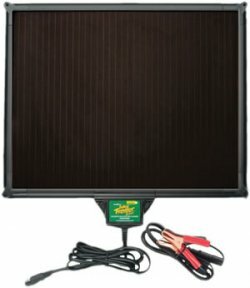 This solar panel typically used in motorhomes, classic cars, boats and semi-trucks. Weather Resistant! This solar panel can be used and left outside as it is water resistant. Just don't submerge the panel in water or other liquid and it can be left outside indefinitely. 13.25" X 16" X 0.875"